Poverty is a problem for a society by considering the socio-political and economic considerations. Socio-political aspect of poverty underlines social exclusion in society. While, economically, poverty can decelerate development process. To alleviate poverty, economists believe that economic growth is important. This, in turn, result in a unique set of policies among government. Minimum wage is one of most popular policy to alleviate poverty. Not only because minimum wage can improve average income of society, but also because it is a low-cost policy (Card and Krueger 1995). The objective of this research paper is to investigate the relationship of minimum wage and poverty empirically. In order to do that this research paper construct a data set of time-series data for fourteen years from 2001 until 2014 and cross section data of 119 districts in the Java. The analysis is run by using three methods of panel data analysis; pooled OLS, fixed effect and random effect method. This research paper also tries to analyze the relationship of minimum wage and poverty in the province level using sub-sample data. 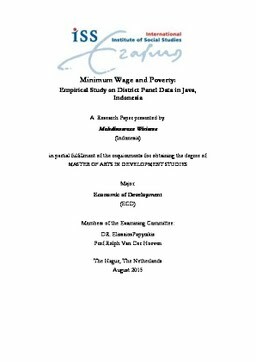 Result of this research papers shows that minimum wage policy in Java can reduce both poverty gap index and poverty rate. However, in the province level, the regression show more varied results. In most of the analyzed provinces, minimum wage has negative effect towards poverty gap and poverty rate.